We use only Bluescope Steel products. They manufacture high strength, lightweight metal roof and wall cladding in an attractive range of modern profiles suitable for homes, industrial, commercial and rural buildings. Ribbed, reliable and now comes in 3 sizes. Corrugated roofing is a reliable product that’s stood the test of time. 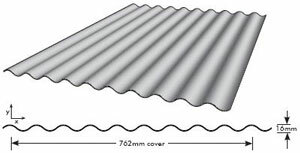 Corrugated roofing can be used as either a roofing or walling product. The profile can reflect a modern or traditional architecture depending on the application. 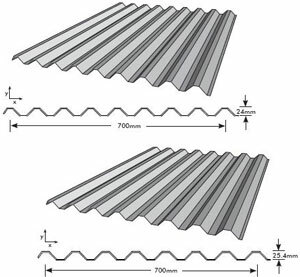 Corrugated roofing is now offered in 3 gauges – 0.42, 0.48 and the new 0.60. The popular 0.42BMT is used predominantly for domestic roofing, the 0.48BMT is used mostly for commercial applications and the 0.60BMT now provides a heavier and stronger profile in the range. Corrugated roofing, with improved technology and manufactured from the highest quality Bluescope Steel, is now the smart choice when considering your roofing or walling requirements. Economical steel wall panel, cladding or short span roofing. Trimdek can be used for domestic and commercial applications as either a roof or walling product. Trimdek’s 760mm sheet coverage is economical and quick to install. The 28mm rib height and specially designed capillary groove ensures watertightness down to a two degree roof pitch. Available in long lasting Zincalume® and Colorbond®. When it comes to commercial concealed-fix roofing, nothing comes bigger or better than 100% Australian Kliplok 700® (Kliplok 700). At 700mm, it is amongst the widest concealed-fix deckings available. As to length, the only limit is your imagination, thanks to our mobile roofing mill. Plus, it’s available in the full range of light and heavy gauge Colorbond® colours. And don’t think concealed-fix steel roofing is only good on the flat. In addition to its unbeatable size, strength and watertightness, Kliplok 700® is also amazingly flexible and well-suited to curved roofs, making it the perfect solution to any commercial roofing project. No screws, no holes, no leaks – plus a watertight guarantee. Best of all, when it comes to installation we don’t screw around. An average 6000m2 screw-fix deck will have about 36,000 screw holes – each one a possible source of leakage and corrosion over time. But revolutionary full-width heavy duty KL75 clips provide incredible holding strength and stability without puncturing the sheeting. The clips are also self locating to ensure perfect accuracy. No screws, no holes, no leaks. In fact, we’re so confident in our Kliplok 700® roofs that we back them with this Watertight Installation Guarantee. Pays for itself with savings in labour, time and supplies. Kliplok 700® may cost a bit more than conventional screw-fix decking. 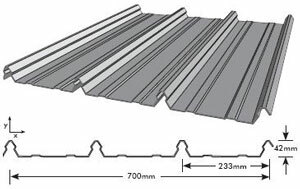 But wider sheets mean fewer sheets, fewer laps and faster installation, and the 42mm profile adds incredible strength so you also need fewer purlins. Kliplok 700’s unique spring-tensioned clips and sliding brackets allow the sheets to move with temperature changes, eliminating the need for expansion joints. In fact, when you compare total costs with traditional screw-fix roofs, you’ll see just how cost effective Kliplok 700® can be. Factor in the long-term benefits of a concealed-fix roof and you have value that’s hard to beat. 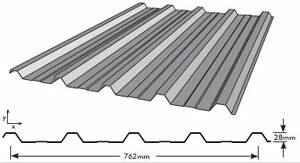 Spandek is a multi-rib design that offers great spanning qualities, greater trafficability and durability in steel roofing and walling applications. Not unlike Corrugated Steel in its appearance, Spandek’s higher, squarer ribs offer greater strength. Available in long lasting Zincalume® and Colorbond®, suitable as either a roofing or walling product.